Welcome to the GI Diet Guide. Information about the low glycemic index(GI) diet & free illustrated low GI recipes. 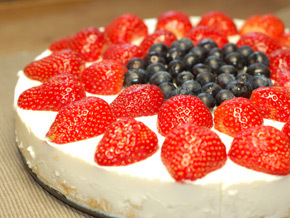 A high protein, low fat, low GI cheese cake that tastes great. I loved this recipe so much I ate it for breakfast too. Exclusive interview with Rick Gallop The GI Diet Guide interviewed Rick Gallop about his personal health and life, the affect of emotions on eating and all things GI related. Interview with dieting legend Rosemary Conley The author of the Gi Jeans diet confesses she can't run. Australian poll reveals GI diet confusion Seven in ten know they should choose foods based on GI ratings, but many are unsure how. Learn about the glycemic index and the benefits of the GI diet. Learn which foods are best to eat to feel full and satisfied. Beautifully crafted low GI recipes with step by step photographs. Practical hints for low GI cooking and eating.